At the Auto Expo 2016 earlier this year, Hyundai unveiled the concept car " Carlino ", a compact SUV, to sit below the Creta. The Carlino, codename HND14, being in the SUB-4 meter car segment, is expected to compete with Ford EcoSport and Maruti Vitara Brezza. Yes, I know, still its a concept car and production version NOT yet unveiled. But, by going through the specifications (likelihood) over the internet, I am very much enthusiast in welcoming the car as a member of my family. Fitst thing is, it is expected to fit in price range of 7-10 Lakhs. Like minded ones please join . Thanks that, Hyundai is also (as I am) very much keen towards bringing the mini SUV on road, in the earliest. Rumour: Hyundai Carlino might get a turbo-petrol engine !! SUV will introduce Hyundai's small-capacity turbo-petrol engine in the market. Which means, instead of the regular 1.2 lt Kappa engine, the SUV will be powered by a 1.0 lt engine capable of developing 118hp. Last month in an interview with TMI, the Puneet Anand, Sr. General Manager at Hyundai Motors, India, stated that the brand will soon be launching a new category in the country without sharing any further details. Known by the codename of QXI, the SUV was first time unveiled at the 2016 Auto Expo, India. It is expected to challenge the dominance of Maruti Brezza, Tata Nexon and Ford Ecosports. It is likely to be priced between Rs 7 lakh-Rs 9 lakh (ex-showroom). As far as specifications are considered, the sub-4 meter SUV will be powered by a new 1.0-litre turbocharged T-GDI petrol engine, which is said to generate the power of 120 PS with peak torque of 171Nm. It will be equipped with the six airbags, Advanced Supervision Cluster, FATC with cluster ionizer, sliding front armrest, leather seats, rear AC vents (expected), smart key with push-button start, sunglass holder, an AVN infotainment system with an IPS display, and LED DRLs. Meanwhile, in another development, Mahindra has also officially teased the launch of its upcoming MPV Marazzo which will be unveiled in September this year. It is expected to be powered by a 1.5-litre diesel engine. The Hyundai Carlino concept which made its debut at the 2016 Auto Expo, previewed a sub-4 meter crossover SUV. The compact Hyundai crossover for the Indian market will sit below the Creta, and would be aimed squarely at the Maruti Vitara Brezza and Tata Nexon. Now, this SUV, in its production ready form, has been spied for the first time testing in India. From the spy shots, we can say that Hyundai is already in the advanced stages of developing the Carlino’s production version, and if the prototype’s shape is anything to go by, the final design has very little in common with the concept. The overall dimensions, however, are in the same ballpark. A prototype, identical to the one spotted here, was spied on test in South Korea earlier this month. The fact that it has surfaced in India suggests that market-specific tweaks are currently underway. The latest interpretation of Hyundai’s trademark hexagonal grille is less edgy and front lighting involves three elements – top-most LED DRLs (not active in the spyshots), low-mounted projector headlights, and foglights. A simple secondary airdam and a silver skid plate round of the front end styling. In profile, it’s difficult to judge how much of the Creta-like silhouette is due to clever camouflaging techniques. The rear too is very well hidden. Like the exterior, we can expect the interior to be instantly recognizable as a Hyundai. We may even see a few bits borrowed from the i20. To be based on the i20’s platform, the Hyundai Carlino is expected to be powered by a 1.4-litre diesel engine which produces 90 PS and 220 Nm of torque on board the hatchback. A 6-speed manual transmission would be standard. Petrol engine is likely to be a 1.2-litre unit considering that it’s a sub-4 metre SUV (excise duty benefits and all). The Hyundai Carlino prototype looks production ready, indicating that it could hit the market sometime in the first half of next year. The automaker may introduce it under a new nameplate since the final styling is a far cry from the concept. Expect price tag in the range of Rs 6.5 to 10 lakhs. Hyundai’s Carlino concept model was showcased as a sub-4 meter crossover SUV at 2016 Auto Expo. 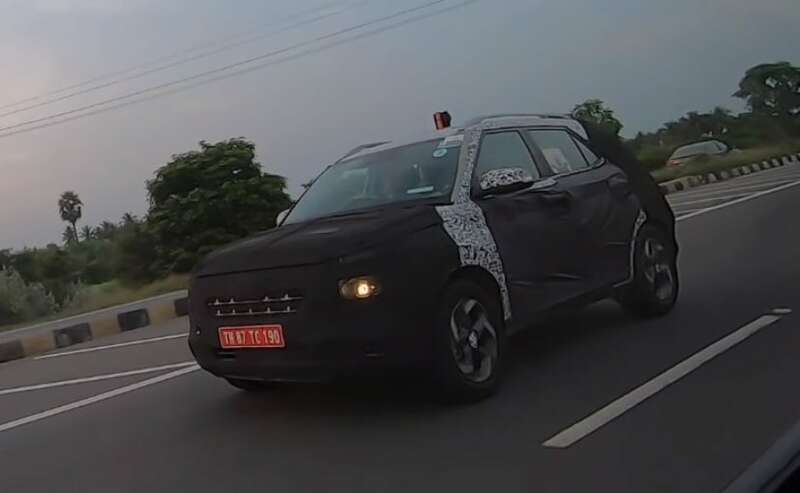 Carlino SUV has recently been spotted on test runs in India and going by the spy shots, it appears to be production ready. As per Evo India, Hyundai has confirmed that the SUV will be launched by early 2019. It will be positioned below the Creta and compete with the likes of Tata Nexon and Maruti Vitara Brezza. Carlino looks quite different from the concept version, since several design changes have been introduced. However, overall size and dimensions appear to be similar to concept version. Earlier this month, a production ready version of Carlino was spotted in South Korea as well. Hyundai is likely to be evaluating some changes to suit the Indian market. Front section has low-mounted projected headlights, LED DRLs and Hyundai’s trademark hexagonal grille that looks a lot sober now. Other styling features at the front include a silver skid plate and a simple secondary airdam. Since the test mule has been effectively camouflaged, it’s quite difficult to tell how much it is based on the Creta model. Overall dimensions, however, clearly reveal it’s a small SUV. Interiors are also easily recognizable as that of a Hyundai, and it seems to have derived some inspiration from i20. Speaking about engines, the Hyundai Carlino will be powered by a 1.0 liter turbocharged petrol engine. This engine is already powering the i20 in many markets globally. It has a peak output of 120 PS. Diesel engine will also be new, and this will be a 1.5 liter engine which will deliver about 115 PS and 250 Nm. Transmission will be taken care by either a 6 speed MT of AT. Considering that the Carlino is a concept name, the SUV may be launched with an entirely new name. It could be priced in the range of Rs 7 to 10 lakh, and compete with the likes of Maruti Brezza and Tata Nexon in the local market. Hyundai have completely changed the CArolino and have made the changes look like the soon to be launched Harrier. So far the Hyundai were copying the likes of Audi, whatever changes the Audi did, similar changes were incorporated in the Creta. the Air dam or chrome border around the air dam or the tail lights. Now they seem to be copying the Harrier? Hyundai is putting together a brand new sub-4 meter compact SUV that will gun straight for the Maruti Brezza, the country’s best selling SUV. Code-named the QXi and first shown to India at the 2016 Indian Auto Expo as the Carlino, the sub-4 meter Hyundai will be launched in India by March 2019. Reports state that the new SUV would be called the Hyundai Styx. With less than 6 months to go for the launch, test mules of SUV have already been spotted. Deriving cues from test mules, here is a render that shows what the production version of the Hyundai Styx/QXi could look like. South Korean carmaker Hyundai is hard at work testing its upcoming rival for the Maruti Brezza. The upcoming sub-4-metre compact SUV is based on the Carlino concept from Auto Expo 2016 and could bear the name Styx when it arrives in India next year. Showcased in concept format at the 2016 Auto Expo, the new Hyundai Carlino SUV is set for launch in India next year. The small SUV has been spied once again, this time in a parking lot. Latest spy shots reveal some of its exterior and interior features. Squarely aimed to take on the Maruti Brezza, Tata Nexon and soon to be launched Mahindra XUV300, the new Hyundai Carlino, though based on the Creta, will be a sub 4 meter SUV. A soon to be Blockbuster of a car by Hyundai. I feel it would have been clever for Hyundai to debut a new 1.5l 4 Cylinder Diesel in this car which I guess would definitely be in their plans. What worries me is the petrol version. 1.2 l Kappa motor from the Grand i10 and Elite i20 is just not capable enough. And if Hyundai brings in their Turbo Petrol, it will still be a guzzler not to forget, increased costs. The much awaited subcompact SUV Hyundai Styx, will make its global premiere on April 17 2019 at the New York International Auto Show in New York City, USA. Sources within Hyundai Motor Europe have confirmed to carandbike that the Korean company's next big global model will in fact be named Styx. In some markets it may have a different name, though the global model will be named the Hyundai Styx. Hyundai Motor India Limited (HMIL) has plans to introduce several new products in the domestic market this year. As part of addressing the segments it doesn’t have a presence in, Hyundai has a subcompact SUV, loosely based on the Carlino concept debuted at the 2016 Auto Expo, waiting for launch likely by the middle of 2019. It could carry the production name Styx and be positioned below the Creta in the lineup. Expected to be priced around Rs. 7-11 lakh (ex-showroom), the Styx is a global SUV catering to not just India but across the globe as it has already been spotted running trials in South Korea and the United States. Before bringing the Styx to India, Hyundai will present the vehicle at the New York Auto Show in April, 2019. This will mark the company’s foray into the highly competitive sub-4 meter SUV segment, which will see the launch of the Mahindra XUV300 on 14th of this month.